Check out a fantastic new Spike Jonze music video for the Parisian clothier/parfumerie Kenzo World starring dancer Margaret Qualley (“Amelia” in Nice Guys) with original track Mutant Brain by Sam Spiegel [Jonze’ brother] & Ape Drums feat. Assassin. The video was choreographed by Ryan Heffington (the man behind Sia’s Chandelier video). We can’t quite make out the opening speech, but we assume the dance (a “diss dance”?) is the speaker’s wife’s (?) reaction to the speaker’s opening words about his wife(?). Regardless, great work by all involved. Next month Bon Iver will release its first album in five years. Cause for celebration: 22, A Million. Justin Vernon and the band have today released another track from the album in the form of the lyric video for 33 “GOD.” Check it out below with all its sub rosa semaphores and voltaic gesticulations. Vernon has always been lyrically cryptic, taking pages from the early-Stipe bible, but 22, A Million sets the shroud-bar even higher. With music this compelling and Vernon’s emotional vocal commitment, however, we remain happy to play along at home. For those also playing along at home, there are a smattering of clues dropped along the way. 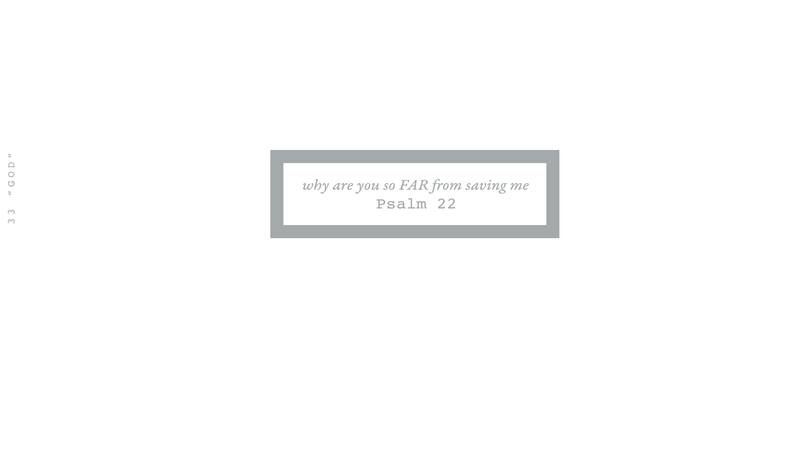 The video opens with an epigraph from Psalm 22: “Why are you so FAR from saving me.” And there’s this from the “biography” of the album penned by Trever Hagen: “If Bon Iver, Bon Iver built a habitat rooted in physical spaces, then 22, A Million is the letting go of that attachment to a place. ‘I’m taking deeper consideration in another kind of place–our friendships and connections to other people.’ Justin proclaims this shift in ’33 “GOD”’: ‘These will just be places to me now’. Rather than places we encounter a collection of numerical relationships: binary code, mystic ages, Bible chapters, math-logic, repeating infinities.” Others might argue that the title references Jesus Christ’s assumed age at death (though it could merely have referenced Vernon’s age two years ago). The song also includes cool Paolo Nutini and Lonnie Holley clues (check the latter out at bottom). 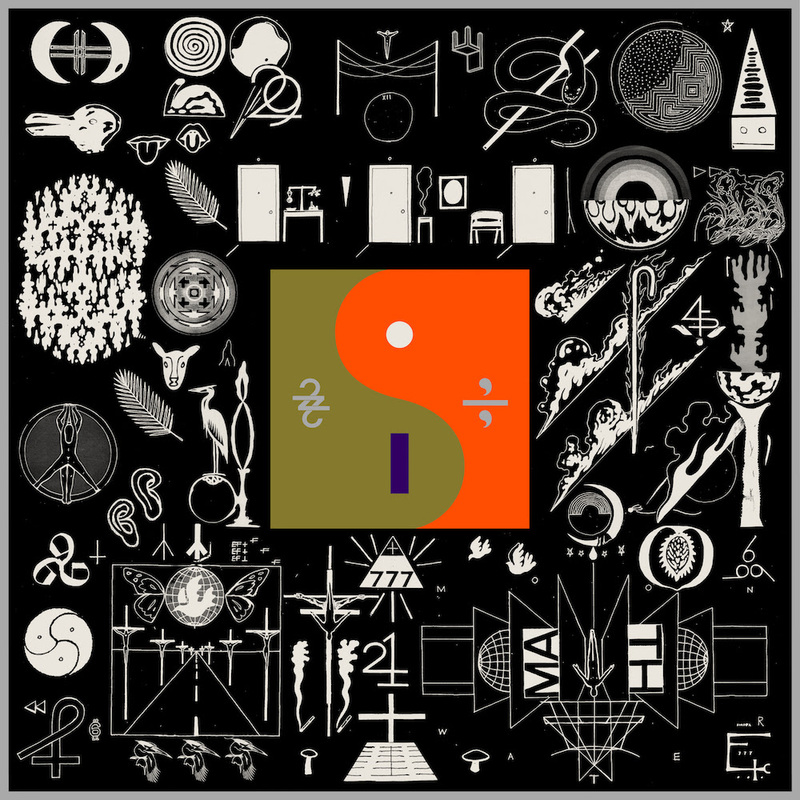 Below the lyric video you can also listen to a live version that Bon Iver debuted at Justin Vernon’s Eaux Claires Music Festival a few weeks back. The highly influential hip-hop swarm known as De La Soul is back at long last with new album And the Anonymous Nobody (thanks initially to $600,000 raised via Kickstarter). Goal! On first blush the new album is a dynamically-diversified musical portfolio that will pay dividends for days, ranging from hip-hop to rock to soul to pop, and all parts in between. 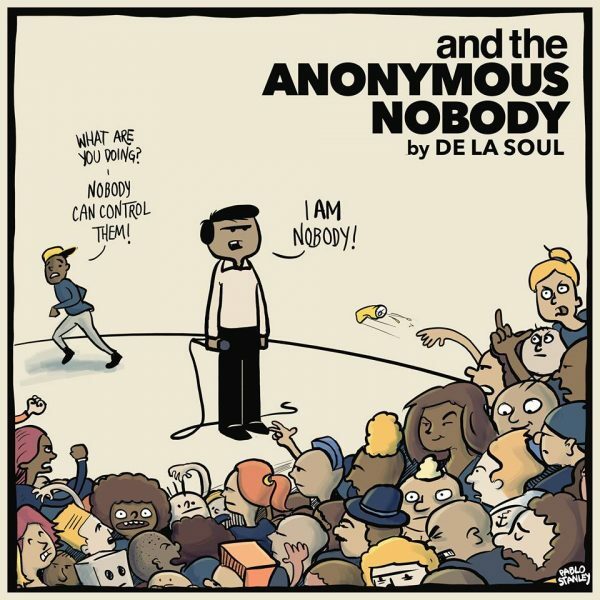 There’s lots to unearth, all as propelled by crafty collabs with David Byrne, 2Chainz, Damon Albarn, Snoop, Jill Scott, and Little Dragon, among others. Our early favorites are Snoopies (with the brilliant Byrne), Memory of…. (with evocative Estelle and Pete Rock), and Here in After (with the almighty Albarn). 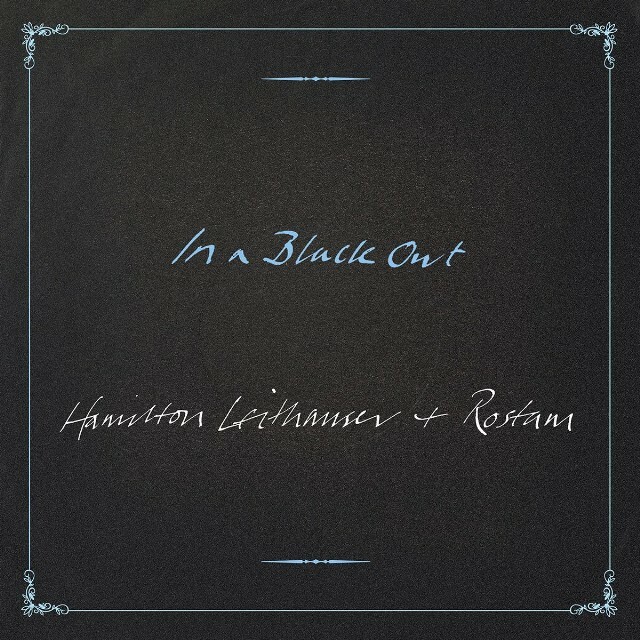 Check ’em out below and go buy the album HERE. Those who know us chapter-and-verse know we are vocoder-averse. Same as it ever was. 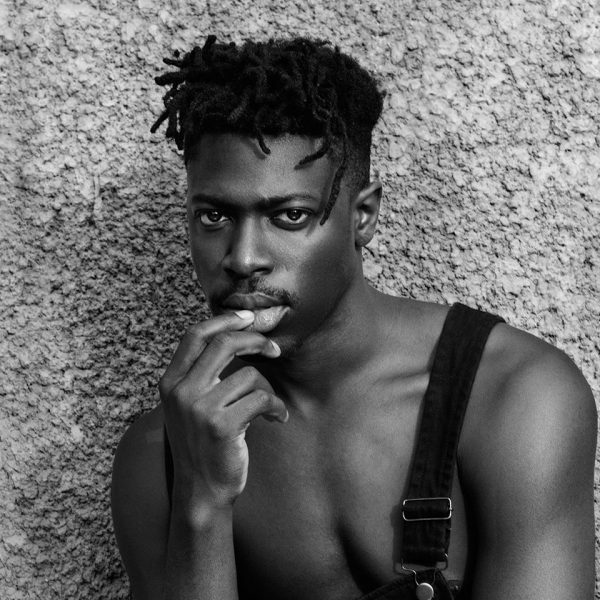 Only a couple of artists have been able to overcome that soul-sucking machine and, with evidence released today, one of them is rising star Moses Sumney. Sumney has been turning ears with his sensational, yet measured, vocals and guitar playing, while gaining notoriety through contributions to cuts by the likes of James Blake, Andrew Bird, Hundred Waters, Mocky, etc. Today Sumney has released his tour-de-vocoder via a new Allie Avital-directed video for song Worth It. You’ll hear that there can be beauty in that vocoder beast. Afterwards check out Sumney’s quintessential Everlasting Sigh (lyrics at bottom) with its Sufjan-Does-Broadway motif and Sumney’s scintillating vocals. Totally worth it. People: a star is being born. There’s a whole lotta great music being spawned by alums of the Berklee College of Music (great new-ish artists Tei Shi and Laney Jones among them). Add to that list the band IAN SWEET, which features Berklee-alum Jillian Medford. 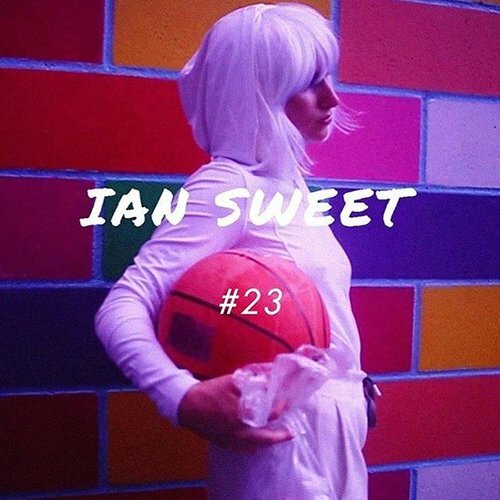 IAN SWEET is soon to release (on Sept. 9th) their debut album Shapeshifter on Sub Pop-affiliated label Hardly Art, and you can pre-order it HERE. The new album sprang from a dark six-month period for Medford, the lowlights of which were panic attacks and depression. To get a feel for the allure of the band, check out their song and video entitled #23 below. The song references the comparative-comfort provided by everyday-TV (“Lately I’ve been feelin’ kinda lonely/Turn on that History Channel/VHS about the mummies/It keeps me company) and her social anxieties (“‘I Believe I Can Fly’/ That was my song at karaoke last night/ I feel like Jordan in my Jordans/ Except I stand in place and ignore him/ I’ll stand right here for another year.'”). We love Medford’s crackling vocals, the jangle-fuzz math guitar and varied tempos on #23. Hole meets Pinback with a twist? Regardless, this is sweet new music, as is the album’s captivating Coney Island ride-choreography. We can’t wait for the album! 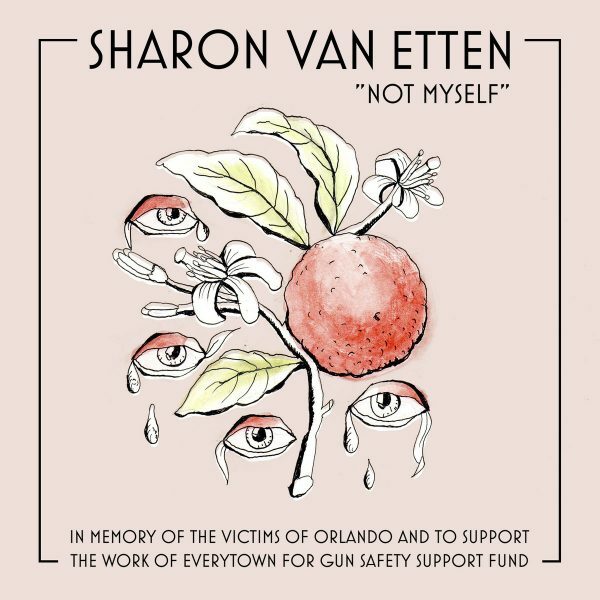 One of our favorite artists, Sharon Van Etten, has released a new song, Not Myself , in memory of the lost lives in Orlando and in support of the work of the Everytown for Gun Safety Support Fund. While on hiatus from the road and while writing new songs, Van Etten has been graciously performing benefit shows (most recently for the Big Sur Soberanes Fire Relief Fund) and writing scores (for new film Strange Weather). 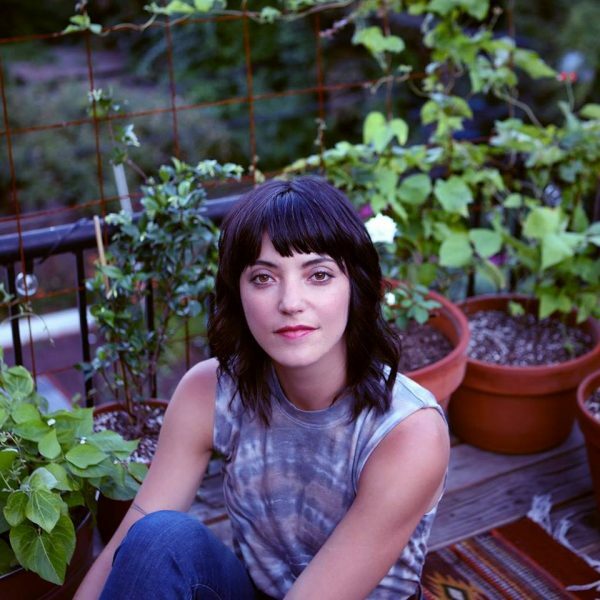 We love everything about this new song, but especially (as usual) Van Etten’s ever-evocative vocals. You can read Van Etten’s statement below and visit Bandcamp for an exclusive conversation about the song. Proceeds from the track will be donated to the Everytown for Gun Safety Action Fund. Go there. Now. “I was home with my parents in New Jersey when I heard of the shooting at the nightclub in Florida. Hate, violence, and intolerance has always upset me, but I haven’t been this overwhelmed with sadness and disbelief in a long time. The victims were only trying to be themselves and be comfortable and safe in their surroundings. That safety was violated out of fear and with a gun. I originally wanted to raise money for the victims and their families, but I knew the issue was bigger than this. 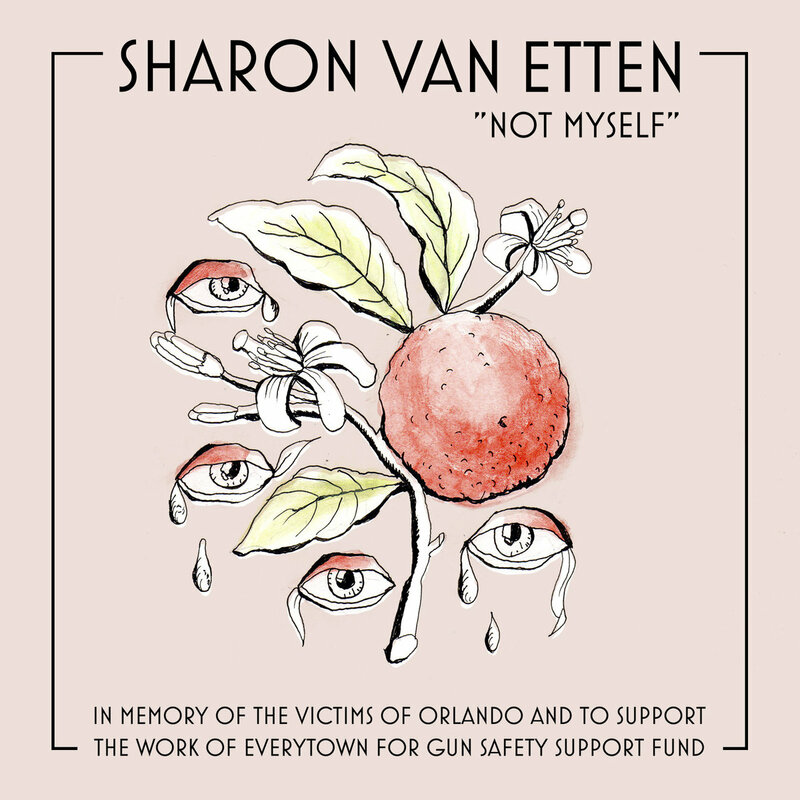 I wrote “Not Myself” for the victims of this horrific event, but I chose to support the research and awareness work of Everytown for Gun Safety Support Fund: a movement of Americans working together to end gun violence and build safer communities. In the memory of those trying to be safe and be themselves, I hope we can all come together to help prevent another massacre like this and end gun violence. It’s been a scant two weeks since we had the good fortune to witness Anderson .Paak & The Free Nationals take Ventura by storm. Since then .Paak has been percolating round the country in support of his phenomenal Malibu album. Yesterday .Paak & The Free Nationals made their way to NPR’s Tiny Desk and killed softly. 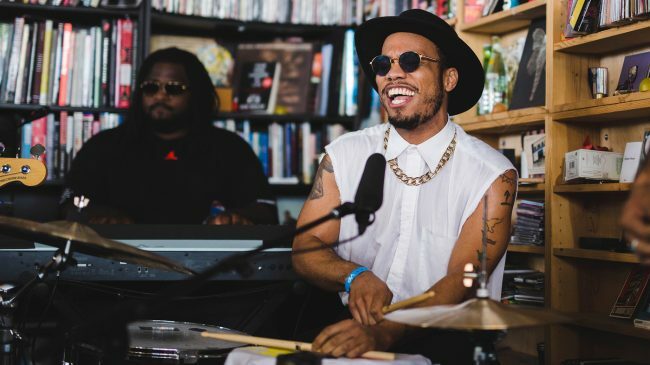 In contrast to the high-decibel and manic energy levels at the Ventura Theater, .Paak and band sat in at the Tiny Desk and gave a tour de force of jazzed up R&B/hip-hop. Watch below as .Paak subtly slays on drums, while guitarist Jose Rios and bassist Kelsey Gonzalez layer on perfectly as they open with lifting single Come Down and then segue into shimmering Curtis Mayfield/K-Dot sounds before closing with (the interestingly-requested) brash older-track Suede. Watch below to get a feel for .Paak’s proficiency and power. Don’t you miss him next time he comes to town. He’s out to take your ears prisoner. What a long, strange trip it’s been for Chance The Rapper. As evidence that the Chicago phenom is blowing up everywhere (thanks Mom! ), Chance made his daytime TV debut this morning on Good Morning America. Following on the heals of his appearances this weekend at Justin Vernon’s Eaux Claires Music Festival, Chance and pals Francis Starlite (Francis and the Lights) and Peter Cottontale (The Social Experiment) evidently teleported overnight to appear on GMA this morning. 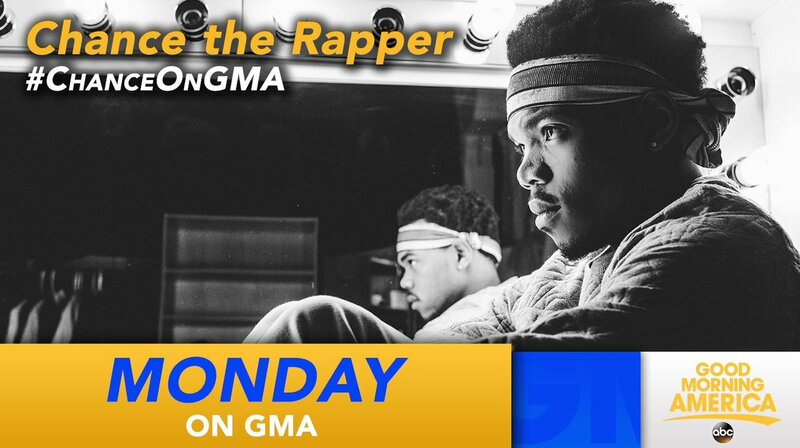 Watch below as Chance and the gang give a stellar performance of Summer Friends (replete with Vernon-esque vocals from Starlite; lyrics at bottom) off his critically-acclaimed monster “mixtape” Coloring Book. You can also check out Chance’s superb interview on the show HERE. As expected, he comes off very well. Fold my ones like a lawn chair, huh, huh! Though it’s only been five years, it seems forever ago that Bon Iver’s eponymously-titled last album was released. Through hiatus and horridness, Bon Iver fans have waited patiently for the other side and new music from the band. That wait is thankfully over. In a flurry of activity yesterday, Bon Iver announced the impending release of their next album (curiously entitled 22, A Million–stunning cover art above), performed the new album in its entirety last night at Justin Vernon’s Eaux Claires Musical Festival (listen to, more than watch, the video at bottom-wow! ), and released two scintillating lyric videos for new songs, 22 (OVER S∞∞N) and 10 d E A T h b R E a s T ⊠ ⊠ . Predictably, we love everything about both new songs, and especially the added glitchin’ effects. Concerns about the new work are immediately dispelled by the opening lyric, “It might be over soon.” The beautiful heaviness continues. Lots to digest and the juices are stewing. Bring on 22, A Million! You can read a well-wrought, revealing piece by Trever Hagen (a long-time friend of Vernon’s) about the new album HERE. The album will be released on Jagjaguwar on September 30th and you can pre-order it HERE. Check this beauty out below and afterwards check out the album’s tracklist, followed by the song’s lyrics.